An analysis of voting precincts in Miami-Dade County with high concentrations of Cuban-American voters shows an 11-point improvement for Hillary Clinton from President Obama’s 2012 margins. These results could indicate that Democrats continue to make inroads among Miami Cuban-American voters and are inconsistent with the argument that President Obama’s Cuba policy hurt Clinton’s chances in Florida. Opponents of President Obama’s Cuba policy pointed to these precincts today to argue that Cuban-Americans voted against Clinton as a backlash against Obama’s policy of ending the U.S. embargo toward Cuba, which Clinton supports. However, when compared to the Obama-Romney results from 2012, Democrats saw an 11-point gain in these areas. *To achieve an apples-to-apples comparison, certain precincts were combined since a redistricting occurred between 2012 and 2016. For example: in 2012, what is now Precinct 330 was half of what was then Precinct 353. Therefore, 2016 precincts 330 and 353 were combined and compared to 2012 precinct 353. Similarly, what is now precinct 413 was 413+459 in 2012. The process of combining precincts to make accurate companions did not affect the candidates’ respective percentages. *Both past and current maps can be found here. *2016 Precinct 413 was updated to include precinct 459 to achieve a precise comparison with the same area in 2012. No voting precinct is homogeneously Cuban-American. These voting precincts are not necessarily representative of the entire Cuban-American community. We can reasonably assume that a 31 year-old Cuban-American voter in Wynwood may have different political views than his grandparents who live in Westchester. Three out of 10 Cuban-Americans do not live in Florida. Between 2012 and 2016, Republicans saw a drop of six points in these heavily Cuban precincts. Meanwhile, Hillary Clinton exceeded President Obama’s share of the electorate by five points. This is a combined total shift of 11-points in Clinton’s favor. When combined with the majority of survey research data; improvements for Democrats in Westchester and Hialeah, the two communities with the highest concentrations of Cuban-American voters in the United States; and exit polling; this 11-point shift in favor of Clinton weakens the argument that Cuban-Americans turned their backs on Clinton because of President Obama’s Cuba policy. To paraphrase Sen. Rubio, we can now dispel once and for all with this fiction that Obama’s Cuba policy hurt Clinton’s chances. Note: The 1 percentage-point discrepancy between President-elect Trump’s performance in this analysis versus the one by Obama’s Cuba policy detractors is due to an apparent mathematical flaw in their calculation since the correct process for finding the total mean for each candidate’s performance in the precincts is to add vote totals for reach precincts and then divide by the total number of votes for all candidates. Instead, they added percentages and divided by 30, which is incorrect. Opponents of President Obama’s Cuba policies argue that by changing his position on the issue, Donald Trump’s performance among Cuban-Americans improved by 21 points, and that this is what clinched him the Sunshine State. To make their case, they point to a September 2016 poll by The New York Times / Sienna College that indeed showed Clinton and Trump at 41-33 percent among Cuban-American voters. They then contrast the 33% figure with the Edison Research exit poll showing Trump at 54% with Cuban-Americans. First, The New York Times / Sienna College poll had a tiny Cuban-American sample of 40-50 people (for our purposes, we’ll just say 50). Such a small sample yields a margin of error of +/- 14 points. No serious analysis would rely so heavily on such a small sub-sample where the group in question was not the primary target of the research. Even the Times’ own polling guru, Nate Cohn, cautioned readers to take the Cuban sample with a grain of salt. This arguments cherry-picks (unreliable) survey results that support their thesis and ignores the overwhelming majority of (good) data that contradicts it. Sixty-two percent of Americans support ending the U.S. embargo on Cuba, according to The New York Times. Similarly, a Bloomberg Politics poll—that nailed the election results—found that two-thirds of Florida voters, including 57% of Hispanics, support ending the embargo. Moreover, a Florida International University survey found that 55% of Cuban-American registered voters (a 743-person sample size with a +/-3.6% margin of error) support President Obama’s Cuba measures. The only reason why the President’s detractors would argue that a 50-person sub-sample is more credible than an academic study where its 743 respondents were the primary research target is because the results of the latter discredits their theory. Certainly, if Cuban-Americans had “repudiated” Obama’s Cuba policy as some argue, Democrats would not have made 9 and 14-point gains in Hialeah and Westchester, respectively, in these two heavily Cuban and traditionally GOP suburbs in Miami-Dade County. The argument that Cuban-Americans tilted the state in the president-elect’s favor is further weekend by historical trends showing that Clinton’s performance was among the highest best showing ever for a Democratic candidate among this electorate (regardless of one’s preferred exit poll). Republicans are supposed to win Florida’s Cuban-American vote. The fact that Clinton ended up in the 40’s and made inroads in Hialeah and Westchester is a good sign for Democrats and should be troubling for Republicans. Of course, the most obvious problem with the argument by the opponents of the President’s Cuba policy is that it overstates the size and weight of the Cuban-American vote in Florida while ignoring the shifts that occurred among other demographic groups, namely the white non-Hispanic electorate that is 10 x’s larger than the Cuban-American (62% vs. 6%). As Dr. Grenier of FIU and I pointed out earlier this week, the Cuban-American vote is still important but it was not decisive in this election. Even if Clinton’s Cuban-American numbers had improved by 10 points, she still would have lost the state. Meanwhile, had she and Trump simply replicated President Obama’s share of the white non-Hispanic electorate, Clinton would have gained an additional 467,000 votes and won the state. As Steve Schale detailed, it was Trump’s strong performance in heavily white non-Hispanic suburban and exurban counties in Central Florida’s I-4 corridor, such as Pasco, Volusia and Hernando that won him the state— not a questionable “shift” among Cuban-American voters. From: Giancarlo Sopo & Guillermo Grenier, Ph.D.
Hillary Clinton’s performance among Cuban-American voters in Florida was strong by historical standards, a sign that the Sunshine State’s Cuban-American vote is still up for grabs. Democrats saw significant improvements from 2012 in Miami-Dade County, as well as Hialeah and Westchester, the two communities with the highest concentration of Cuban-American voters. There is no evidence that the Cuban-American vote was decisive in Florida or that President Obama’s Cuba policy hurt Clinton’s chances. A majority of Cuban-American voters support the new U.S. policy and a significant share of the policy’s supporters are Trump voters. White non-Hispanic voters were the key to Donald Trump’s victory. Clinton would have lost Florida even if she had won the Cuban-American vote by five points. An Edison Research exit poll used by television networks and a Latino Decisions election eve survey show Hillary Clinton earning 41% and 47%, respectively, of Florida’s Cuban-American vote. As the following chart shows, Clinton’s performance was strong and the second best ever for a Democratic presidential candidate among Florida’s traditionally Republican Cuban-American community. The Latino Decisions study also found that Clinton won a majority (50%) of the country’s Cuban-American voters, the highest share ever recorded for a Democratic presidential candidate. Approximately three out of 10 (32%) Cuban-Americans live outside of Florida. Hillary Clinton surpassed President Obama’s 2012 performance in Miami-Dade County, Hialeah, and Westchester. This would seem to bolster the argument that Cuban-Americans are increasingly voting Democratic and weakens the case that President Obama’s Cuba policy softened support for Clinton. In Miami-Dade County, where one out of three residents is Cuban-American, Clinton won by nearly 30 points, 63.7% to 34.1%, an 81,196-vote improvement for Democrats from 2012. Obama / Romney 541,440 61.6% 332,981 37.9% + 208,459 + 23.7 pts. Clinton / Trump 623,636 63.7% 333,901 34.1% + 289,735 + 29.6 pts. Difference +81,196 + 2.1 pts. + 920 – 3.8 pts + 81,276 + 5.9 pts. Democrats made inroads in the majority Cuban and traditionally Republican city of Hialeah where Clinton exceeded President Obama’s 2012 vote totals by 5,950 votes. Conversely, Republicans saw their 9.1-point 2012 margin vanish. Obama / Romney 27,675 45.2% 33,267 54.3% + 5,592 + 9.1 pts. Clinton / Trump 33,625 48.9% 33,718 49% + 93 + 0.1 pts. Difference + 5,950 + 3.7 pts. + 451 – 5.3 pts. – 5,499 – 9 pts. In addition, Democrats saw a 14-point improvement from 2012 in the suburb of Westchester, the U.S. community with the highest percentage of residents born in Cuba. Obama / Romney 4,463 36% 7,856 63% + 3,393 + 27 pts. Clinton / Trump 5,480 42% 7,219 55% + 1,739 + 13 pts. Difference + 1,107 + 6 pts. – 637 – 8pts. – 1,654 – 14 pts. Some have claimed that President Obama’s Cuba policy may have cost Clinton in Florida. We found no evidence to support this. It is unclear what, if any, role U.S-Cuba policy plays in determining how Cuban-Americans vote. Strong majorities of Cuban-Americans and Floridians favor engagement with Cuba. According to an August 2016 survey by Florida International University (FIU), 64% of Cuban-Americans in Miami-Dade County support the new Cuba policies, including 55% of Cuban-American voters. The study also found that 58% of Cuban-American voters support the Obama-Clinton policy of ending the U.S. embargo, and 61% support diplomatic relations with the island. FIU also found that among the Cuban-Americans voters who said they support the new U.S. policy, four out of 10 (41.6%) identified themselves as Trump supporters. Support for the new Cuba policy extends beyond the Cuban-American community. The most recent Bloomberg poll showed 67% of likely Florida voters favor engagement with Cuba. Since at least 1980, Florida’s Cuban-American voters have leaned Republican, but have trended Democratic in recent elections. Some are suggesting that Cuban-Americans cost Hillary Clinton the state. Two conditions would be required for this to be true: (1) Clinton’s performance among Cuban-Americans would have to be unusually low and (2) Clinton would have won the state had she mirrored past performances among Cuban-Americans—both are false. Cuban-American voters were approximately six percent (570,878) of the 9,415,638 Florida voters who cast a ballot for President and 6.7% of Trump’s supporters in the state. Despite stronger showings for Democrats in Miami-Dade County and Cuban-American neighborhoods, some may cite polls to argue that Clinton under-performed President Obama’s 2012 share (48%) of the Cuban-American electorate by anywhere between one (47%) to seven (41%) points. However, a one to seven-point gap between Clinton and Obama’s shares of Cuban-American voters would only account for approximately 5,708 to 39,962 votes—well short of Clinton’s statewide deficit of 114,455-votes. In fact, ceteris paribus, Clinton would have still lost Florida (and the election) even if she had defeated Trump by five points among Cuban-American voters. It is therefore clear that Cuban-American voters were not the deciding factor in Present-elect Trump’s victory. As was the case across the country, Trump’s performance among white non-Hispanic voters was, by far, the single most important factor to his victory in Florida. In 2016, white non-Hispanic voters were 62% of the electorate; yet, they made-up 81% of Trump’s statewide coalition. Republicans made gains in predominantly white non-Hispanic counties. For example: Trump’s margin over Clinton in Pasco County was 51,945 votes, a 14,164 vote improvement for the GOP compared to 2012. In Lake County, Trump’s victory margin was an increase of 13,447 votes for Republicans since the last presidential election. Sixty-four percent of Florida’s white, non-Hispanic voters supported Donald Trump, while 32% backed Hillary Clinton. In 2012, President Obama and Mitt Romney received 61% and 37%, respectively, of Florida’s white non-Hispanic voters. Trump’s 32-point advantage was an eight-point improvement for the GOP from 2012. Had Clinton mirrored Obama’s 2012 performance among Florida’s white non-Hispanic voters and kept Trump at Romney’s support levels, she would have narrowed her 2016 gap among this demographic by approximately 467,015 votes and kept Florida in the Democrats’ column. UPDATE (11/16/16 at 7:59 PM): A previous version of this memo hypothetically stated that Clinton would have lost to Trump even if she had won the Cuban-American vote by five, 10, or 15 points. This has been corrected given that under certain models, depending on the size of the vote for third-party candidates and turn-out levels for other demographics, a Clinton victory would have been possible had she won Cuban-Americans by 10 points or more. This does not change the memo’s main conclusions given the unlikeliness of a 10-point victory for a Democratic presidential candidate among Cuban-American voters. Giancarlo Sopo is a communication strategist and founder of CubaOne Foundation. He was formerly the head of marketing and a communications consultant at Benenson Strategy Group, as well as a teaching fellow on Leadership and Presidential Politics at the Harvard University Extension School. Guillermo J. Grenier, Ph.D., is a professor of sociology and graduate program director in the Department of Global & Sociocultural Studies in the Steven J. Green School of International and Public Affairs at Florida International University. Dr. Grenier has authored and co-authored six books and dozens of articles on labor, migration, immigrant incorporation, and Cuban-American ideological profiles. approximately 240 Cuban-American voters with a margin of error of +/- 6.3%. The two findings are statistically consistent given their margins of error. Source: Lopez, Gustavo. (2015, September 15). “Hispanics of Cuban Origin in the United States, 2013.” Pew Research Center. A new CBS / YouGov poll released today shows Hillary Clinton leading Donald Trump by five points among likely voters in Florida, including a 14-point advantage among Hispanics. Ninety-four percent of Hispanic voters who selected Trump or Clinton said that they’re unlikely to change their minds—the highest level of certainty among any demographic. With less than three months to go before Election Day, Clinton’s +14 lead is similar and within the margin of error of President Obama’s 2008 (+15) and 2012 (+21) performance with Hispanics, which were widely seen as critical to placing Florida in the Democratic column both years. Conversely, Trump’s 39% share of the Florida Hispanic vote, while high compared to his national average, mirrors Mitt Romney’s 2012 performance, the lowest for a GOP presidential candidate in recent state history. The only demographic where Trump leads Clinton in Florida is with white voters who make up approximately 67% of the electorate and where he’s winning by 11 points, 48-37. Silver lining? Not exactly. Trump is underperforming Romney’s 2012 numbers among whites by 14 points in Florida. As the race currently stands, Clinton can lose Florida—along with Iowa, Ohio, and Nevada—and still become President, but these latest numbers point to a decisive win in the Sunshine State. A recent Time op-ed argued that Hillary Clinton’s running-mate, Sen. Tim Kaine, was among a long list of examples of American brands and leaders that pander to Latinos. When Clinton announced her pick, many Latino pundits were disappointed, but there was a silver lining offered: Tim Kaine speaks Spanish! Rather than address the lack of people of color running for and winning higher office, Latino communities were expected to be content with the fact that Kaine speaks both English and Spanish. Big deal. So do I. So does my family. So do millions of Latinos. 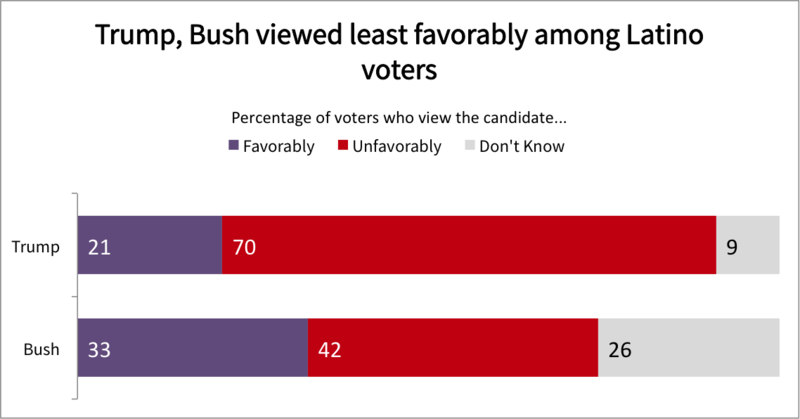 So did Jeb Bush, now the long-forgotten Republican presidential candidate hopeful. The U.S. has the second most Spanish speakers in the world, following Mexico. Roughly 11.6 million people in the U.S. are bilingual. Yes, capturing the hearts and minds of a diverse $1.3 trillion market is a top priority for U.S. companies and political parties, and some get their Latino outreach horribly wrong. Tim Kaine isn’t one of those people. The three basic rules for engaging Latino voters and consumers are: (1) Be Authentic: Latino consumers and voters are sophisticated and can sniff out phonies. We want policies and brands that advance our communities and we will not automatically support you merely because you speak Spanish, particularly Latino millennials; (2) Values Matter: All Latinos want to know that you respect our culture and share our values; and (3) Understand the Nuances: Brands and politicians should understand the diversity among Latinos. Salvadorians in Columbia Heights, Boricuas in Alphabet City, and Cubans in Kendall are all Latinos, but they’re also different consumers. Authenticity: Kaine’s near-perfect Spanish isn’t a phony focus group concoction; it’s who he is. He didn’t learn Spanish to win votes, and he doesn’t just speak it come election time. More importantly, his policy positions—from immigration reform to health care to taxes, education, and U.S. Cuba relations—are perfectly aligned with the views of the majority of voters within Latino communities. Values: How Tim Kaine learned Spanish—as a Jesuit missionary helping impoverished families in Honduras—speaks volumes about his personal values, and most importantly, it shows that he values Latinos. Regardless of whether you’re a Spanish-speaking Latino or not, all Latinos can respect Kaine’s life story and the fact that he’s a white politician who embraces their culture at a time when it’s under attack. Nuances: Hillary Clinton introduced Tim Kaine in Miami where speaking Spanish isn’t just smart politics, it’s necessary to a large and critical voting and consumer bloc in the country’s top swing state. For example, in the Miami media market, Univision and Telemundo newscasts frequently win the ratings battles among all demographics. While it’s true that Clinton would have likely won Latino voters by large margins regardless of whom she selected as her running mate, based on what I’ve described above, we shouldn’t dismiss Tim Kaine’s role in helping to broaden or deepen her support among Latinos and/or non-Latino voters who value diversity. It would be wise for Latino leaders to resist accusing someone who has dedicated his life to serving our communities, shares our values, and understands our diversity of pandering merely because he speaks Spanish. Kaine’s fluency, life decisions, and values should be praised by Latinos, as should those of other politicians and brands that follow suit. Between work and travel, it’s been difficult to do any writing recently beyond 140 characters. And sometimes a mix of all of the above. 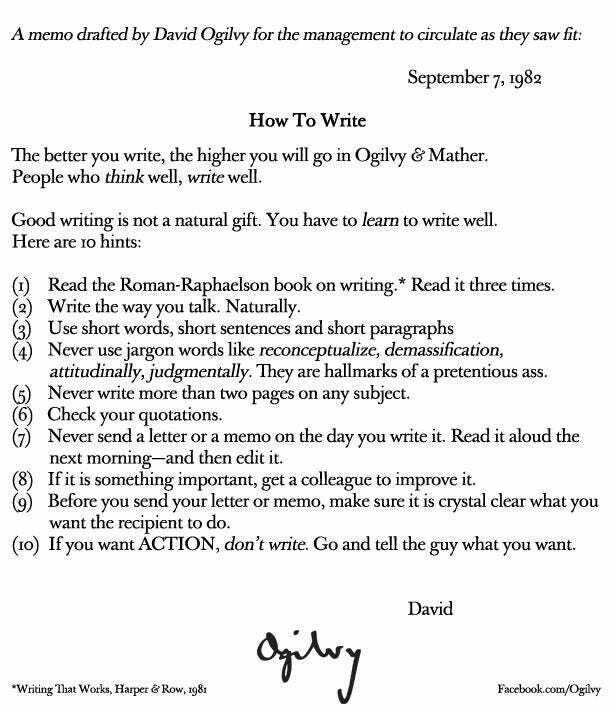 I’ll try to keep my posts short and sweet (think Seth Godin’s blog), hoping to strike a happy medium between Twain and Twitter while trying my best to adhere to Ogilvy’s rules. Follow along and if you have any questions / thoughts, feel free to reach out.